Mugshots of the Brady Gang. From left are Shaffer, Brady and Dalhover. By the beginning of 1937, the Golden Age of Bank Robbing was over, and all its major players were either dead or serving long prison terms. George “Machine Gun” Kelly and Harvey Bailey were among the first to go, captured in the fall of 1933. After that, others fell like dominos. Verne Miller, the ultimate good guy gone bad, was killed in November of that year and Wilbur Underhill, the “Tri-State Terror,” was gunned down in December. January of 1934 saw the one-day capture of the entire Dillinger Gang: Harry “Pete” Pierpont, Charles “Fat Charlie” Makley, Russell “Booby” Clark and John Dillinger (who would later escape and continue his crime spree). 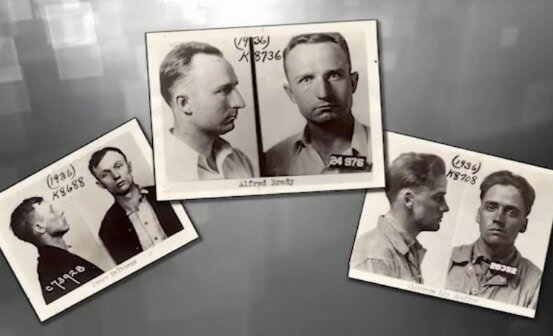 April brought the death of John “Red” Hamilton, a member of the second Dillinger Gang. Clyde Barrow and Bonnie Parker, although never major players but whose wild shootouts and senseless murders garnered national headlines, were killed in May. That same year saw the deaths of Tommy Carroll in June, Dillinger in July, Homer Van Meter in August, “Pretty Boy” Floyd in October and “Baby Face” Nelson in November. January of 1935 saw the capture of Arthur “Doc” Barker, and the deaths of his brother Freddie and his mother, about 10 days later. The Barkers’ partner in crime and the last of the true Big Names, Alvin “Old Creepy” Kapris, was finally arrested in May of 1936. In between these headline-grabbing stories, many secondary players, such as Larry DeVol, Albert Bates, Harry Campbell, John Paul Chase, Fred Hunter and Harry Copeland, as well as most of the bandits’ wives and lovers, were all arrested, tried and sentenced. So as 1937 dawned, there was only one loose end remaining – Al Brady and his gang, which included James Dalhover and Clarence Lee Shaffer Jr.
Not considered major players initially, the gang catapulted itself into national attention with three murders and more than 150 armed robberies within just a short time …... and Brady being quoted as saying, “I’ll make Dillinger look like a piker” didn’t win him any friends in law enforcement. elevated it to the top of the list and with Hoover on a roll in the War on Crime, the FBI went after the gang with a vengeance. The chase ended in October with a wild gun battle on the streets of Bangor, Maine, which left Brady and Shaffer dead and Dalhover in custody. 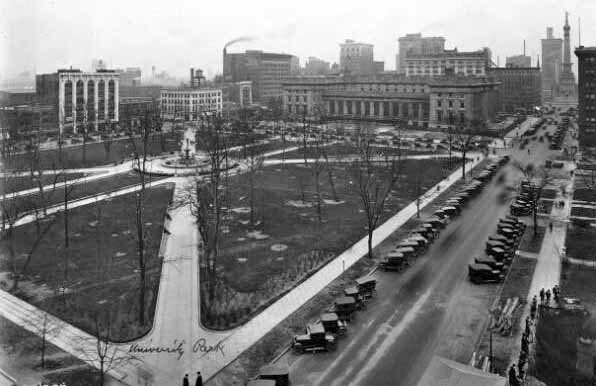 University Park in Indianapolis in 1929. Clarence Lee Shaffer, Jr., the youngest of the gang, was born in Indianapolis in 1916. His parents separated two years later, and Shaffer went to live with his grandparents in Indianapolis. Aside from attending Ben Davis School in Indianapolis, there are few records on Shaffer. However, there is some indication that when he was about 12, he began stealing and stripping automobiles and continued this into his teens. In later years, he took on a series of odd jobs, such as cutting grass and hauling coal. A co-worker, Charles Geiseking, would later join Brady and briefly service as a fourth member of the Brady gang. In the summer of 1935, Shaffer became engaged to a young woman and, in an apparent attempt to put his past behind him, opened a hamburger stand in Indianapolis. However, he closed the stand after a few weeks and in November, learning the girl was pregnant, abandoned her and returned to his criminal ways, eventually joining Brady and Dalhover and embarking on a crime spree. Alfred James Brady was born near Kentland, Ind., on Oct. 25, 1910. He lost his father at age 2, his mother at age 16 and his stepfather at 18. He spent the next few years wandering and working at various jobs such as errant boy, clothing store clerk and factory worker …. and was also involved in various crimes which resulted in multiple arrests on minor charges. After serving six months at the state farm in Greencastle, Ind., for a July 1934 arrest on possession of stolen property, Brady and released visited a friend who owned a farm in Hanover, Ind. It was here he met Dalhover, a neighboring farmer. The most information is known about Dalhover because after his capture, he was questioned at length about his life and criminal career. Rhuel James Dalhover was born in Madison, Ind., Aug. 24, 1906, and by age 11 was serving time in a Plainfield, Ind., reform school after he and his older brother George robbed a country grocery store. Released after 16 months, Dalhover moved with his mother to Cincinnati and later to Kentucky. He found work as a farm hand and then took a job at the National Biscuit Company in Cincinnati, where he worked for two years. From there he moved to Arizona, returning to live with his father in Madison in 1924. Back in Cincinnati by July of 1925, he married Anna Moore and they eventually have two children. The following April, he left a job at Standard Service Company and began making moonshine for his wife’s grandfather until November when he and his brother George were arrested in Union, Ky., and charged with transporting illegal alcohol. They were fined $100 each and sentenced to 100 days. Within three weeks, however, they escaped and returned to Cincinnati before making their way to Madison where they stole a car and left for Arizona. They stole a second car in Roswell, N.M., but were soon captured and sentenced to 1½ to 2 years in the New Mexico State Penitentiary. Released after 13 months, they were turned over to Kentucky officials and given a two-year sentence in the Kentucky State Reformatory at Frankfort for charges in connection with their escape. Finally released in November 1929, Dalhover returned briefly to Cincinnati before going back into the moonshine business in New Richmond, Ohio. In January 1931, Dalhover, now 24, and another brother, John, went to California where he worked at various jobs before returning to Madison where he split his time between working with his father, a cabinet maker, and making moonshine. By July of 1933, the whiskey business became so good that he left his father’s shop and went into moonshining full time. With the profits from this venture, he purchased his farm near Hanover where he continued making whiskey through 1934. According to statements made to the FBI after his arrest in Maine, Dalhover said at the time he met Brady, the federal and state governments were cutting off his yeast supply which he needed to make whiskey, and that Brady — on his visits to Hanover — would bring him yeast from Indianapolis. In March 1935, Dalhover’s luck ran out and his farm was raided and his still destroyed. He was tried in July in Madison and was sentenced to 60 days and fined $500. He served his time at Greencastle and was released Sept. 8, 1935, returning to his farm. It was at this point that Brady suggested he join him in holdups. Dalhover said he refused and Brady left but returned a couple of weeks later in a car he said he had stolen in Indianapolis, and this time he was able to convince Dalhover to join him.